Earlier this week Collider was invited to visit Disney’s animation studios to check out almost half-an-hour of footage from its upcoming video game riff, Wreck-it-Ralph and chat with the film’s director Chris Moore and several of the animators. During the visit, we saw how the film moved from concept to screen and got a peek inside the technical challenges involved in bringing the Ralph’s five wildly different worlds to pixelated life. We’ll have all of that for you in the coming days, right now, let’s just focus on the footage screening. Hit the jump for a summary of what we saw. 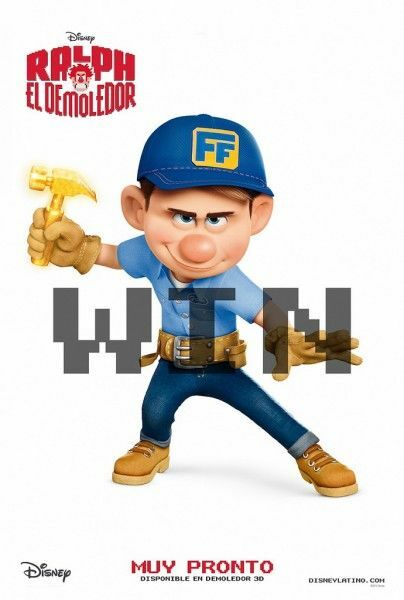 I n the world of the movie, Fix-it-Felix Jr. – basically Donkey Kong with a handyman in place of Mario’s plumber – is one of the most enduringly popular video games of all time. The story takes place inside a dusty old arcade cabinet and begins as the denizens of the game gather to celebrate thirty years on the job. Everyone exalts Felix, (Jack McBrayer) for his work saving the day. Meanwhile, Ralph (John C. Reilly), sits watching from his home, which just happens to be a giant pile of bricks located in the middle of the city dump. Depressed by the prospect of always being the villain and never having a friend, Ralph decides to crash the party. After humiliating himself in front of a crowd, he sets off on a quest to beat another video game, win a gold medal, and prove to everyone that he is a hero. First, Ralph tries his hand at Hero’s Duty, a Halo-style game that looks and moves a lot like a sequence out of Starship Troopers. Here, he meets Sergeant Calhoun, (Jane Lynch) a no-nonsense platoon leader. Ralph spends the game running around and trying to avoid being eaten before somehow getting a hold of a gold medal and escaping the game in a spaceship. Even with the medal in hand, Ralph can’t get home yet because his ship crashes into Sugar Rush, a Mario Kart-style racer set in a world made entirely of candy. Here, Ralph meets Vanellope von Schweetz, (Sarah Silverman) a glitch in the game who steals his medal so that she can finally have a chance to race. After seeing how Vanellope is treated by the other Sugar Rush characters, Ralph decides to help her build a car, learn to drive and win another gold medal for him to take home. 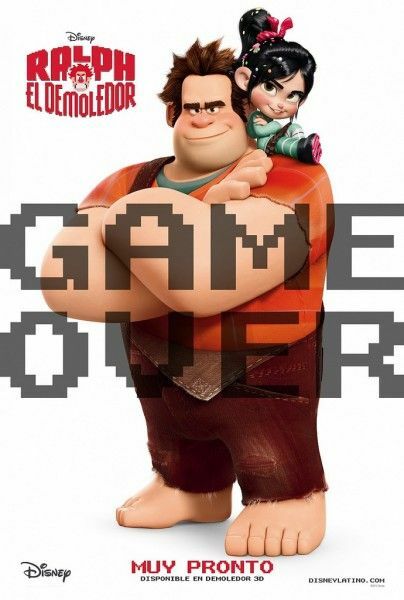 While all of this is happening, Felix leaves his game to search for Ralph and ends up working with Calhoun ,who is on a mission to track down a dangerous bug that Ralph accidentally transported from Hero’s Duty into Sugar Rush. First thing’s first, Wreck-it-Ralph is big. Like, huge. Like, the average animated movie has about 40 characters and Ralph has 188. It has scope and style and Bowser and Q-Bert and Sonic and a twist on pretty much every classic video game you can think of. But while it’s really cool to see a villain support group held in the ghosts’ starting position from Pac-Man, the conceit isn’t all that different from any number of internet fan videos. Fortunately, the film’s creative team went a lot further than just creating 8-bit namedrop jokes. The world of Niceland, Ralph’s home, is fully realized and very inventive. The animation manages to be state-of-the-art while still capturing the lo-tech charm of an old Nintendo animation cycle. The characters move jerkily without sacrificing nuance in the performances and little touches like all the round angles being slightly square and the pixelated look of the splattered cake go a long way to grounding the kitschy concept. If the worlds of Hero’s Duty and Sugar Rush are less instantly iconic than that of Niceland, they make up for it in speed and color. The soldiers versus bugs sequence set to a brand new Skrillex track looks absolutely insane. We didn’t see too much, but it honestly could have been clips from a Halo movie. Similarly, Sugar Rush looks to have all the colors and buoyancy the recent Alice in Wonderland redux lacked. Clearly John Lasseter has Disney’s writers reading up on the classics: The Incredibles was Randian, Ratatouille was Proustian, Up was existential and now the non-Pixar Ralph has distinctly absurdist flavor, immediately calling to mind Albert Camus’ The Myth of Sisyphus. Ralph’s beginning point is compelling and complex and is reflected nicely in Vanellope’s dilemma; he’s sick of playing, she just wants one shot. And Vanellope’s status as a glitch and her various digital malfunctions place her as a very, very sad character indeed. She spends her nights hiding out in the unfinished track for her unfinished level, cuddling up with candy wrappers as her blankets as she dreams about the day that she’ll finally get to race. She’s like a physically disabled and orphaned undocumented ten-year old with delusions of grandeur. So, you know, not your typical Disney heroine. 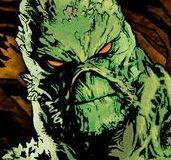 Unfortunately, it seems that the powers that be are a bit afraid of some of the film’s intricacies. In addition to all the beautiful animation, well thought out takes on digital worlds and legitimately philosophical themes, the movie also features a lot of potty humor. Like, a. Lot. Of. Potty. Humor. I’m pretty sure that every single scene we were shown had at least one joke about peeing one’s pants, homophone confusion between Hero’s Duty and Hero’s Doody, or some other scatological theme. Everything else is awesome, but the extreme childishness of these jokes is way out of place and below the standard of the film’s other elements. I doubt they will be enough to make viewers dislike the film, but it’s a little disappointing to see. 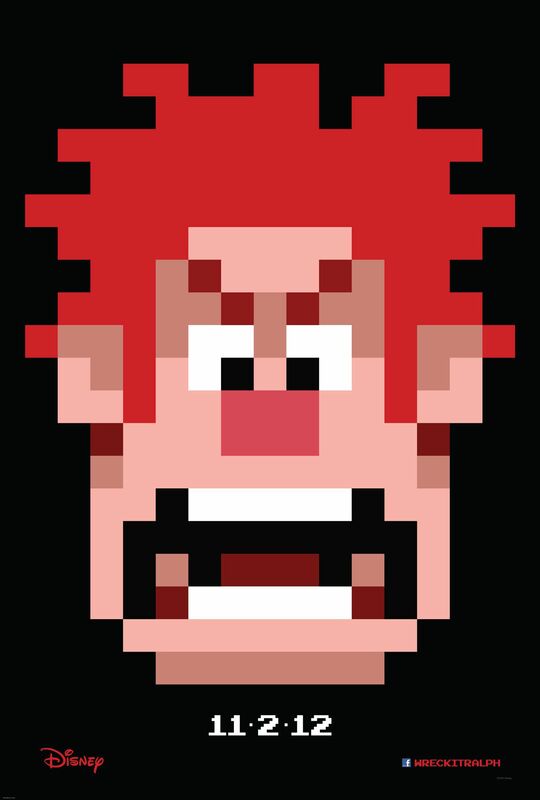 That said, Wreck-it-Ralph looks like something I would pay money to see. And I might play the video game too.